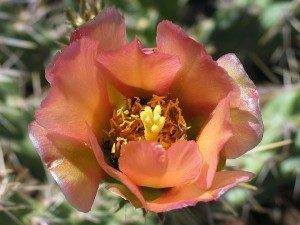 A very rare cactus found only in the wild in three areas between Santa Fe and Chimayo will have a new home thanks to Daniela Roth, NM’s endangered plant program coordinator, the Santa Fe Institute, and the Santa Fe Conservation Trust. 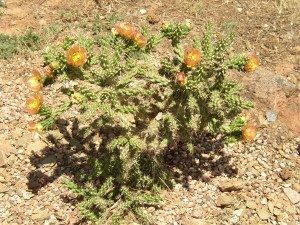 Smaller and bushier than the more common “tree cholla,” the Santa Fe cholla has bronze and salmon colored blooms, as opposed to the fuchsia flowers that fill the common cholla. In the fall of 2019, volunteers will establish a new home for the endangered species at the Santa Fe Institute Miller Campus in Tesuque, which is permanently protected by a conservation easement held by the Santa Fe Conservation Trust. A similar project took place at the Santa Fe Institute Hyde Park campus in 2015. 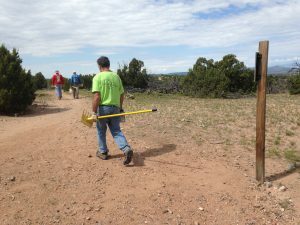 A community-wide effort to help revitalize the endangered species has been spearheaded by the Cactus Rescue Project, the Native Plant Society of New Mexico, the Santa Fe Botanical Garden, and the Endangered Plant Program of the New Mexico Energy, Minerals, and Natural Resources Department to establish a permanent conservation sites for the rare cholla, which cannot be found anywhere else in the world.